I'm generally terrible at posting things in time for holidays and special events, but I promised myself I was going to post something before Thanksgiving, even if it meant losing sleep. Fortunately, I haven't lost any sleep getting this done. This post, instead, cuts into my essay-writing time. Yes, sleeping and blogging are higher on the list than finishing any of the gazillion essays I have due in the next 2 weeks. I hope none of my instructors are reading this. 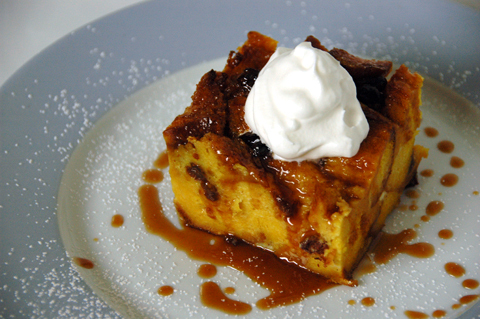 If you're not a big pumpkin pie fan, this pumpkin bread pudding is a good alternative. And you get to kill two birds turkeys with one stone. Let me explain. The pumpkin bread recipe makes such a large amount that you'll have enough to feed 8 to 10 people at dinner and make this dessert. How awesome is that? The pudding recipe I always use is this one I found on All Recipes. How much bread will you need? Just enough to fill up an 8x8 pan. That's a little more than the 6 slices called for in the original recipe and I think it results in a more dense pudding. You may also consider substituting half and half for any part of the whole milk. Since the pumpkin bread doesn't have raisins, I threw those in. Or you could use a mix of raisin bread and pumpkin bread. If you decide to serve with the caramel sauce, you may consider cutting down on the sugar a bit. I think I used 2/3 cup. I'm not even going to attempt to explain how to make caramel and luckily there are plenty of recipes and instruction on the Interwebs. It's easy once you've done it a couple times, but if you're a first timer, read through the method explained on Simply Recipes. Elise's method is easy to follow and her recipe makes a fairly thick sauce. I like my sauce thinner so I tend to use more liquid. No, the liquid does not need to be cream. I've used milk before and it was fine. For the sauce I made to go with the pumpkin bread pudding, I used 1 cup sugar, 1/2 stick butter, 1/4 cup coffee mixed with about 1/2 cup half and half. The finishing touch is the whipped cream, but boy, wouldn't a dollop of vanilla ice cream on top just be spectacular? Have a happy and safe Thanksgiving everyone! Justin, I'd choose this over pumpkin pie any day! It seems like a complicated dessert to throw together, but it's really nothing once you have the bread made. Of course if you can buy the pumpkin bread, it's a cinch. Happy thanksgiving! Yeah, I would've thought rosemary would have given this an odd flavor :) I didn't know (or just forgot) you were back in school! Pumpkin bread looks great. But WHAT! NO PRESENTS?! Manggy, yes, I'm back in school, but just for a short time. Until June. Working on getting my teaching license. What a gorgeous way to enjoy pumpkin. I haven't gotten sick of it yet - so much pumpkin, so little time. Darlene, this sounds just wonderful. I hope you had a wonderful holiday.